In comparison with long-term average June was below the average as to the temperatures and markedly above the average as to the precipitations. Total rainfalls in May and June reached 229,4 mm which represents 51,8 % of the whole year amount. At the same time both months were colder than average. Heavy rain caused the flood in certain localities. In Saaz area in total 180 hectares of hop gardens were flooded by rivers or creeks with total damage on 70 hectares. In Auscha area 200 hectares flooded, of it 100 ha damaged totally. Further local damages were caused by waterlogged soil due to long-continuing rainfalls. Till the end of June approx. 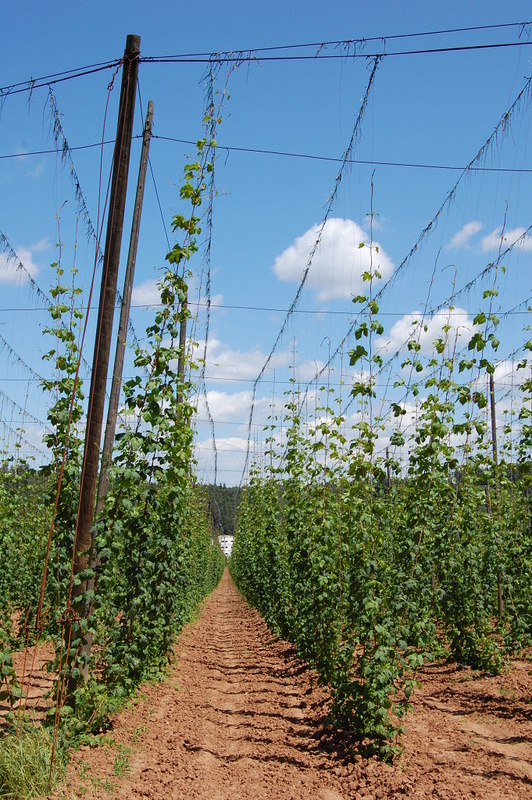 30 % of hop plants did not reach the top of the trellis. High humidity created optimal conditions for spreading of Peronospora however waterlogged soil made the treatment difficult. Further development of this disease has been stopped. The hop plants are in the stage of the creation of side shoots. Attached picture made on July 1st reflects the present situation - hop plants did not reach 7 meters.